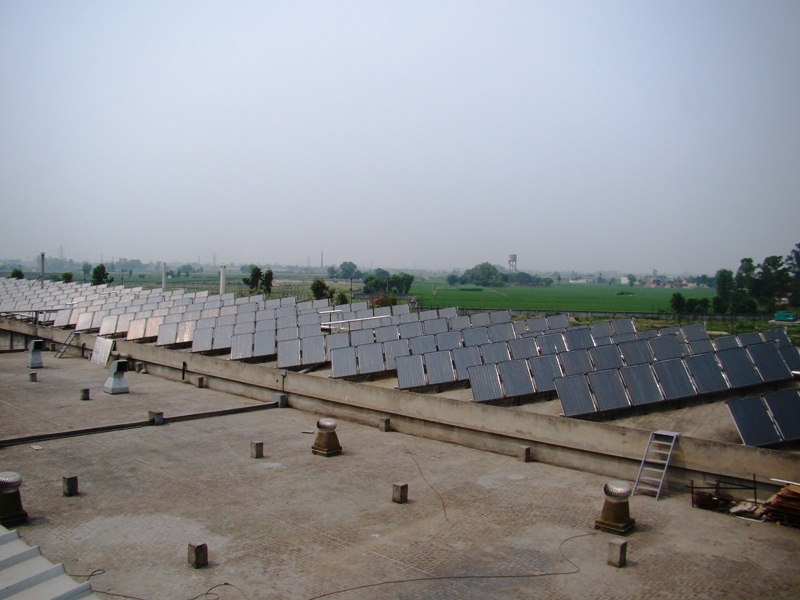 The country’s largest ever industrial solar plant that became operational in district Ludhiana today is set to perform twin functions of generating solar power besides offering permanent solution of disposing off large quantity of industrial effluent water by evaporating it.Disclosing this here today, Bikram Singh Majithia, Non Conventional Energy Minister, Punjab said that Punjab today got proud distinction for permanent disposal of large quantity of effluent water by evaporating them without causing any damage to environment besides generating power from steam generated from solar panels. He said that Punjab Government has installed India largest Solar Thermal System in Kangaroo Industries Limited at village Kanech, near Sahnewal in District Ludhiana having capacity of 1 lacs liters per day for evaporation and condensation of waste water of Industry. He said that the company is manufacturing staplers and staple pins than involves cleaning and galvanizing steals strips and wires. During the process, 12000 to 15000 LPD water was produced that was unfit for consumption that could cause air and soil pollution if discharged into ground. He said that as per pollution control norms the waste water of chemical process cannot be discharged into ground. As per pollution control norms the waste water of chemical process cannot be discharged in to the ground, hence zero discharge norms are in force in the state. To meet these norms the waste water of chemical process is cleaned through RO systems for reuse by Kangaroo Industries Ltd. He said that the left out waste water of RO system is evaporated and collected through condensation process for reuse leaving the solid waste behind. Majithia said that to feed the waste water and to complete the evaporation and condensation process, the Kangaroo Industries Ltd. has installed a largest ever solar water heating system with 1000 flat plate collectors having 2000 s.q.m. collector area at their campus in village Kanech in district Ludhiana.He said that in the field of Solar Thermal system, Punjab has taken the lead and during the current year 7 lakh liters capacity solar water heating system installed in Punjab by PEDA. Besides that 20 lakh litre capacity solar water heating system had already been installed in Punjab. Majithia informed that besides this solar plant the PEDA has already installed nine solar plants at GNDU Amritsat, Army Institute of Law SAS Nagar, Indo Global College of Education Abhipur (Mohali), Nothe India Hotel and Industries Jalandhar, Hotel City Heart Ludhiana, DSM Anti-Infectives India Let. Toansa (Nawanshahar), Ranbaxi Industries Ltd Ropar, Punjab Bhawan New Delhi and Dashmesh Academ Anandpur Sahib.He said that the Punjab Government has set a target to generate 1000 MW electricity from non conventional energy. The Minister further said that to promote the use of Non conventional energy the Punjab Governments agency PEDA has providing 30 percent subsidy to the beneficiaries on installation of non conventional energy units in domestic, institutional and industrial sector. Besides that Punjab Government has also made the use of solar water heating system mandatory in all categories of buildings using hot water.